Use ComicLife (for Mac/PC Windows). If you dig this tool, I can get you a full license. 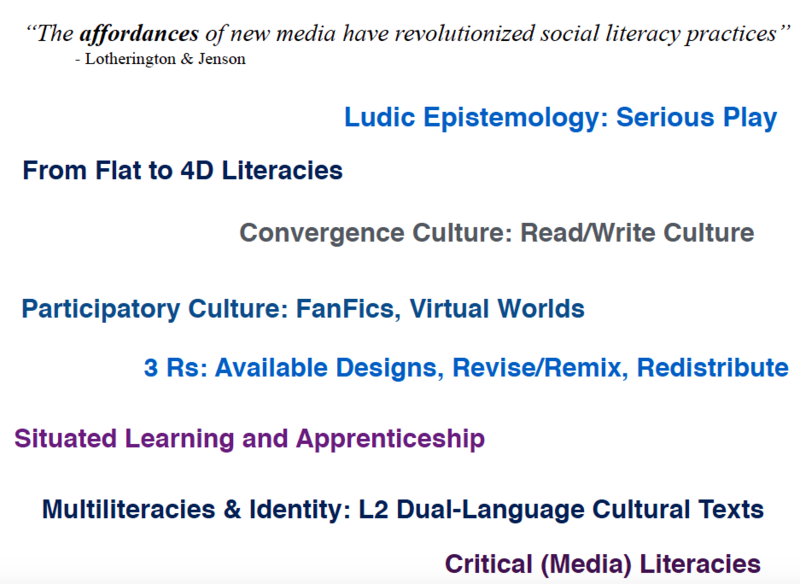 Option 1) Serious Comic: Putting Multimodality to Work: Starting from the Lotherington & Jenson article, create a multimodal graphic text that explores and develops concepts or themes from the reading (e.g., serious play, ludic epistemology, flat to 4D literacies, L2 learning culture/identity texts, convergence culture, participation). Integrate at least two key quotes from the text/s. 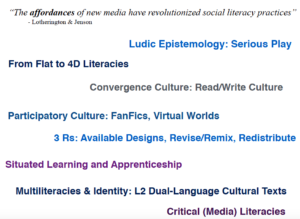 Please dig deep into the theory – and have fun playing with the media tool, coming up with interesting and innovative ways to present knowledge and/or tell a ‘theory story’ mobilizing the ideas from the text (or other readings or experiences). 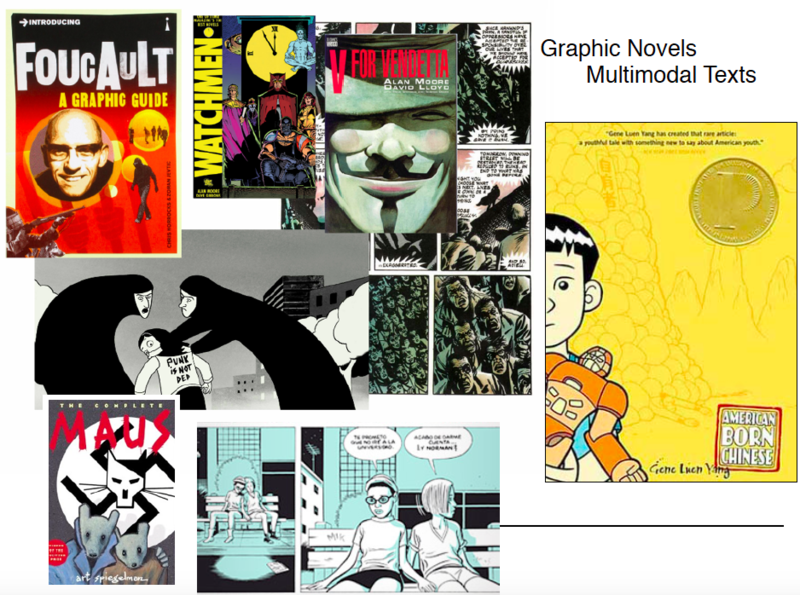 You can also create a meta novel (if you wish) where you explore opportunities of multimodal text production and theory as you create your graphic narrative. Create an L2 dual-language comic that integrates L1 and L2 (English in translation) and that tells a story about language, culture, diversity, place, identity, etc. (also explored in article by Lotherington & Jenson). You may explore your own experiences, stories, conflicts, and histories navigating language, identity and culture). If you choose option 2, ensure that the text is dual-language (both languages appear together, somewhat like a polyglot text, though in graphic narrative form). 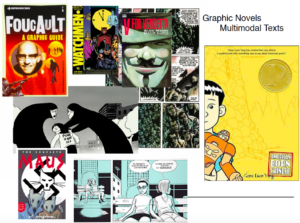 Option 3) After reading the Option 1 and 2 – simply come up with your own innovative, ‘template-breaking’ take on digital storytelling using ComicLife – and that pushes the aesthetic, technical and storytelling boundaries of the tool or the graphic text/comic genre. Find a few good design models (‘available designs’) – and remix and (re)design. Avoid creating a simple ‘comic strip’ and experiment with the affordances of the tool. Four Page (minimum): Post to your website,/ no page limit if you want to keep going. Keep a list of references for curated images on a separate word doc. Due in Two Weeks, but start having fun now so we can reflect the experience and process of ‘making’ and multimodal design, and explore what and how people learn through remix and digital storytelling.